Edgar Allan Poe Tattoos reveal your inner darkness to the world. 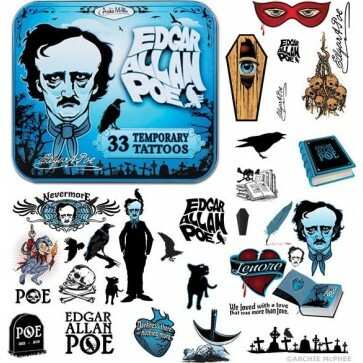 Thirty-three temporary tattoos come in an illustrated 5" x 51/2" x 1/2" (12.7 cm x 14 cm x 1.3 cm) tin. They are inspired by such stories and poems as "The Tell-Tale Heart," "The Cask of Amontillado" and "The Raven." These are the perfect thing to entertain yourself if you're ever BURIED ALIVE! Twelve shrink wrapped tins in each illustrated display box.